Did you know that the health benefits of yoga include everything from stress relief to improving chronic health conditions such as depression and even cancer? For some reason it seems like when a woman hits forty everything in her life begins to change. The kids are grown and begin to leave home, long term marriages seem to either dissolve or need to be redefined, physical changes due to menopause and the process of aging can seem to leave you feeling a bit more fatigued and less enthusiastic about life. Middle age should be a great time in a woman’s life, but for many women it can be a time of feeling abandoned, angry and out of step with the world and your own minds and bodies. This often results in health problems caused by stress and the natural aging process. Just because you are over 40 doesn’t mean your life is over. In fact it is the start of an entire new chapter, and yoga can help you to get your mind and body into shape to face the next 40 years with enthusiasm and good health. Yoga for relaxation can be the catalyst for learning how to be happy at any age. 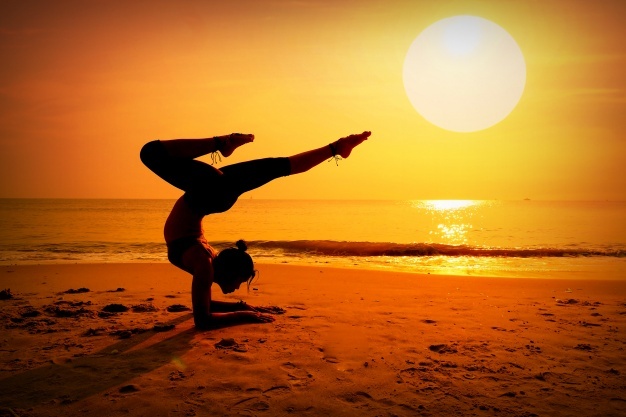 Sense of self – Yoga can help you get back in touch with who you are. The techniques you learn during yoga and the need to concentrate on every part of your being from your breathing to your mental and emotional center helps you to reconnect to who you are giving you a sense of yourself as a person that you may have missing for quite a long time. Increased energy – Although yoga is a form of exercise, its unique techniques help to replenish your energy reserves. Women who consistently practice yoga claim that they feel less tired and have more energy than they did in their 20s or even 30s. Feelings of well being – Another health benefit of yoga is that it provides you with a sense of physical and emotional well being. Yoga can not only make you feel better about yourself, but about the world around you and life in general. You’ll find yourself looking forward with enthusiasm to each new day. Stress reduction – Yoga teaches you to control your breathing which helps you control your body and quiet your mind. Focusing on your breathing instead of the overwhelming chaos of your daily life fosters balance, peace, and calm. Improved minor health issues – Probably one of the most important health benefits of yoga is that it helps to strengthen your immune system. Stress and the physical aches and pains that we feel as we get older can have a negative effect on our immune system making us more susceptible to colds and other more serious illnesses. Yoga helps to relieve stress and those aches and pains that are part of the aging process which in turn strengthens your immune system and results in improved health. Improves chronic and serious health issues – Yoga also helps with more serious and chronic health issues such as cancer, depression, chronic pain, anxiety, high blood pressure, and debilitating insomnia. Promotes weight loss – As an added bonus for us women, yoga can be a catalyst to help us lose weight. Improved memory – Consistent yoga practice has been proven to improve memory, concentration, focus, and enhance mental clarity. This is especially valuable for menopausal or pre-menopausal women. Increase in confidence – Yoga helps us integrate our bodies and mind which makes us aware of our gifts and potential. The self awareness you find from regular yoga practice will naturally increase confidence and self esteem. Develop intuition – Yoga can help us develop our intuition which unfortunately many of us learn to ignore as we get older. We let the voices of our friends, family, and society overrule our inherent wisdom and intuition. Consistent yoga practice helps us focus on our inner guidance. A grant is a honor of access to an organization, or a budgetary guide grant for an understudy to further training. Grants are granted on different criteria which fluctuates from nation to nation. A worldwide understudies ought to apply for grant alongside his application, as colleges abroad require isolate application for the same other than application for confirmation. Typically it is granted with the I20/offer letter, yet in the event that not, an understudy needs to select in the different grant programs offered by the college and different offices in the nation relying on his qualification. Besides, there are some Indian establishments, for example, Inlaks Shivdasani Foundation, which awards grants to Indian understudies and the term of the grant will be up to 2 years. It covers for the period conceded educational cost charges, sufficient everyday costs and one-way travel. Justify: The beneficiary might be controlled by understudies athletic, scholarly, masterful or different capacities. The fiscal esteem might be unimportant, if the grant is intended to rouse the understudy and advance the investigation of the subject. The biggest grants are normally justify based. Humanism: This is monetary guide where candidates should at first qualify by race, religion, or national root. Subsequent to separating the candidates in view of their ethnicity, extra figures are taken thought to decide the last beneficiaries. Graduate Teaching Assistants are those graduate understudies who are included in guideline, typically of students. Qualified GTAs perform instructional obligations in a region of their mastery, regularly inside their home offices, albeit qualified GTAs may perform showing obligations outside their areas of expertise. Explore led by Graduate Research Assistants (GRAs) is a critical segment of the aggregate supported research at MSU. GRAs frequently lead look into in a significant range of their real course of study under the bearing of an employee. GRAs are relied upon to work 15 to 20 hours for each week. The exploration is generally a part of the staff consultants look into that is straightforwardly upheld by outer financing. GRAs are by and large anticipated that would do a particular research extend which regularly frames the reason for a postulation or exposition. Graduate understudies may likewise hold work in different limits (i.e. , understudy work, for example, custodial, cafeteria help, mentoring, and also grouped, proficient or aide positions). Any non-assistantship position must be affirmed by the college preceding tolerating business. A person who goes to the college as an understudy might be utilized fundamentally through a graduate instructing or research assistantship. In any case, understudies may likewise fill in as an understudy worker. For this kind of work, an Employment Authorization Form must be submitted with endorsement from the understudy’s counsel and the particular division of the college. Graduate understudies may not be utilized for over 20 hours for every week aggregately for all types of work on grounds. that many individuals apply for these honors, and grants don’t take care of the whole expense of study. that the understudy may not be granted grant in the primary semester alongside I20/offer letter, yet doubtlessly the understudy will get it from the second semester simply after the satisfaction of the prerequisites. Decent evaluations are to a great degree essential in securing a global grant.